Twitch is a popular online service for watching and streaming digital video broadcasts. Launched in 2011, it accelerated in 2014 and has since become a major presence on the Internet. Our first live-streaming broadcast was launched at 12:00 noon EST on Jan. 15, 2019 and was extremely well received by those participating. Twitch gives AEF a unique opportunity to showcase our programs like never before, showing more “behind the scenes” moments: training sessions, our aviary enclosures at Dollywood, our wild nest cams, events, and much more! A primary goal is to educate a new demographic that has been historically hard to engage in large numbers — those 18 to 34 years of age. We hope Twitch will be the vehicle that will do that! An avian veterinarian explaining what’s involved in a raptor check-up. Caregivers talking about a specific bird species they most frequently work with – and what it’s like to be an avian caregiver. Guest speakers from other wildlife organizations sharing stories with our audience. Stories of rescue, rehabilitation, recovery, and release. Showcasing our wild eagle nests and events are especially engaging – such as when eggs hatch out into baby eaglets! 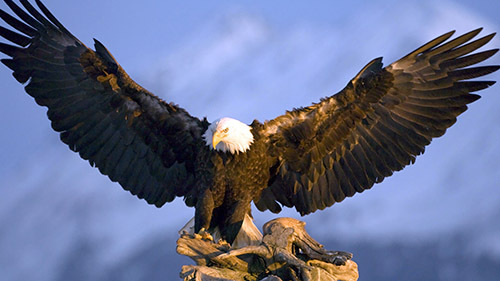 Get to know the staff at the American Eagle Foundation. And – don’t forget that during any presentation, the Q & A live chat is there for additional information and to answer your questions. You might even want to suggest a topic for a future broadcast. A schedule of coming events will always be posted so you can save the date to join us. In addition, there will undoubtedly be occasions where we have an impromptu session — for example, if eggs are hatching out in a nest! A live chat is part of the experience, so your questions can be posted and answered by the AEF team standing by and ready to help. We would love for you to “follow us” so that we can rise up in the Twitch ranks and offer more features! If you follow us, you will also receive notifications on our channel’s activities, including when we go live. Follow Us by clicking on the heart above the screen on the right. Our early scheduled programs will be Tuesdays and Thursdays at 12:00 noon – with no set end time. As our channel gains viewers, more program time will be added.